On October 24, 2010, Wedding Rings Forever attended a bridal show at the Grand Hall in the Gateway Center. The most common question to arise concernced the white and black ceramic bands. Most people were quick to shy away, thinking ceramic rings will be weak and break. At first, I too was skeptical with thoughts returning to things I'd made in high school pottery class. 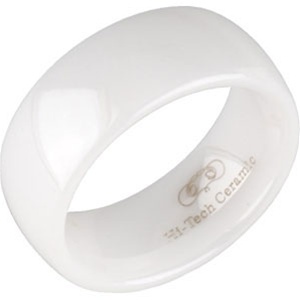 However, the new high tech ceramic compounds forming their ceramic wedding bands is something completely different. Clearly, if any of the above listed items were remotely close to a mid-century Chinese vase, their purpose would not be properly served. One can clearly see that this is a material superior to many others. It is also completely hypo-allergenic. Try one on, and become a believer! There are also still many people searching for black tungsten rings. The black portion is a plating that will wear and scratch off over time, exposing the natural gray metal beneath. Ceramic rings, on the other hand, are the same color all the way through, and will stay looking new for years to come. If you insist, Wedding Rings Forever is still happy to make a custom black tungsten ring. However, the same warranties are not offered because of the inferiority to their ceramic ring counterparts.